Growing up in Great Falls, Montana, Kate Spencer brings big skies and Western color schemes to many of her oil paintings featured at A Candle in the Night, stop #14 of this month's Gallery Walk. Her collection of portraits and landscapes highlights her eclectic talents in using oils to capture her family, friends and the world she sees and loves. Inspired by her rendering of a large portrait of her brother, this show is her first, and it is clear she is still finding herself. 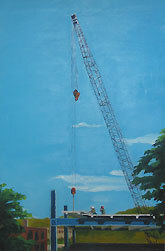 Quoting one of her mentors, Ric Campman of River Gallery School, she admits: "All the balls are still up in the air." Her work is so diverse, it is like viewing the work of multiple artists in one show. She explores many different subjects and palettes, giving the show a broad view of her artistic journey through the medium of oils. For instance, "Crows in the Meadow" is a soft rendering of crows in flight against a backdrop of winter fields. She admits using "birds out of the bird identification guide," but the rendering is still fresh and soft in the colors chosen and the position of the birds in flight. In startling contrast is "Montana Haystacks on the Cleary Ranch." The vivid sky drips purples and blues over haystacks lying burnt-orange in the sun. The striking color contrasts give the piece a Southwestern mystery as the forms and landscape blend into a bright structure sleeping on expansive plains. Spencer states she prefers to paint en plein air (outdoors). "I'm big on skies -- that's the Montana influence -- the color and the grace in the West (is) where my soul is." She often takes photographs and works with them back at her Western Massachusetts home studio, a tree house originally built for her daughter. When she switched to oil painting in order to study with an artist in Tuscany, she realized she couldn't work on the dining room table as she had with watercolors. "Freeze Out Lake" is a series of Montana landscapes where the sky is high and gray, and the landscape is low and reflective of this meditative sense of colors: grays and whites. Using the softer palettes of watercolors, but the strength of oils, she has captured a calm state of the world as if the soft light on the land is the only subject, and a bit of vegetation and a meandering of water an afterthought. The effect is pale and restful, with an underlying restlessness giving some energy to the tranquil setting. Her "Montana Skyline" (9" x 12") is a portrait of a wild pony against a big sky; an electrical transformer has a companion portrait in the background. She is unromantic in her compositions, juxtaposing the wild elements of nature and the objects of civilization. Her paintings are at once real and dreamy, rendered by a keen observer of how the spirit of the land intercepts with the material world she sees. This summer she painted en plein air with the River Gallery School's landscape painting classes at Scott Farm in Dummerston. In the heat of one of the hottest summers in memory, she rendered a farmscape painting while stationed under the shade of a covered bridge over a cooling waterfall. This illustrates some of the challenges plein air landscape painters encounter, and how determined and resourceful a painter must be to do this kind of painting. "Building the Parking Garage" incorporates Spencer's big sky element from Montana with a portrait of construction in downtown Brattleboro. The sky dominates despite the powerful intrusion on the townscape by crane and metal. It is a documentary-style painting capturing Brattleboro's changing face. Many of her paintings are of family members. For instance, "Razzy on the Beach" is a beach scene of her daughter holding a sarong around herself with the wind whipping the material into a perfect foil of dark against the light of the ocean background. Spencer took a lot of art in high school, but her parents refused to let her go to art school because they felt it would not lead to a job. Ten years ago, she did one painting of a dream she had of two friends who were going through divorces. Then five years later she met an artist friend in Puerto Rico and became inspired to paint seriously again. She has studied with Ric Campman and Lydia Thomson of the River Gallery School, Eric Aho at the Great River Arts Institute of Walpole, New Hampshire and Caleb Stone at Monhegan Island. She says she draws inspiration from the work of John Singer Sargent, Winslow Homer and Edward Hopper, as well as modern artist Don Stone. 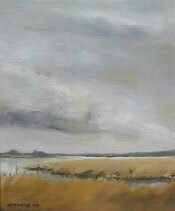 Kate Spencer: Portraits and Landscapes runs September 4-30 at A Candle in the Night, 181 Main St., 802-257-0471.